Physicians and aestheticians use a variety of facial resurfacing techniques to improve the appearance of the skin by addressing skin quality, age spots, fine lines, and scarring. These techniques include traditional dermabrasion, chemical peeling, laser resurfacing, and microdermabrasion. All of these modalities exert their effects by resurfacing or ablating the skin at various depths and promoting skin healing. Microdermabrasion ablates the most superficial aspects of the skin using a high-pressure flow of crystals. The clinical results of these various skin-resurfacing techniques relate to the skin target depth desiring correction and the depth of ablation performed. The concept of facial resurfacing dates back to 1500 BCE, when Egyptians reportedly used sandpaper to improve scars. In the early 1900s, dermabrasion was developed to promote skin rejuvenation and was modified to its modern form in the 1950s. Dermabrasion involves ablating the skin to the level of the dermis to promote skin regrowth. Based on the power dental equipment design, the dermabrasion machine uses a wire brush with a diamond fraise to mechanically ablate the skin. Local anesthesia is required to perform the dermabrasion procedure. The technique is operator dependent, and, thus, highly skilled surgical technique is required to obtain optimal results. Reported complications include excessive bleeding, infection, scarring, and hypopigmentation. Furthermore, healing usually takes up to 7-10 days, owing to the deep dermal damage. Microdermabrasion was designed by Marini and Lo Brutto in Italy in 1985 and addressed some of the adverse effects inherent with dermabrasion. Advantages included ease of use, painless nature with minimal complications, minimal inconvenience to the patient, and proposed overall effectiveness. Monteleone presented the clinical effectiveness of this new technique at the Third Meeting of the Southern Italy Plastic Surgery Association in 1988. The technique spread throughout Europe during the late 1980s and mid 1990s, until eventually Mattoli Engineering introduced microdermabrasion to the US market in 1996. Microdermabrasion quickly gained widespread popularity, owing to its low risk, rapid recovery time for patients, and apparent results. Most skin resurfacing techniques demonstrate clinical efficacy, but also carry the potential for serious complications such as pigmentary changes and scarring. These complications are related to the depth of skin abrasion obtained. Limitations of the procedure include a clinical effectiveness limited to more superficial issues and the need for multiple treatments to achieve clinical results. It is ineffective for deeper wrinkles or scars that extend beyond the epidermis. The most superficial later is the stratum corneum, which is composed of multiple layers of keratinocytes that are constantly sloughed and regenerated. This is the layer that provides the major barrier function and is targeted during mechanical exfoliation. The stratum lucidum is found mainly in the palms of the hands and soles of the feet and contains a dense layer of keratin filaments that provides additional structural support. The stratum granulosum contains granules containing a lipid rich content that creates a waterproof barrier for the skin. The stratum spinosum is the thickest layer of the epidermis and contains multiple polygonal spiny cells rich in cytokeratin and with desmosomal intercellular connections. Langerhans cells, dendritic cells, and other immunomodulating cells are located throughout this layer. The stratum basale contains one to three layers of cuboidal or columnar cells that are mitotically active and generate the cells that comprise the other layers of the epidermis. Melanocytes and Merkel cells can also be found within this layer. The dermis forms two layers and is composed of connective tissue—the papillary layer and the reticular layer. 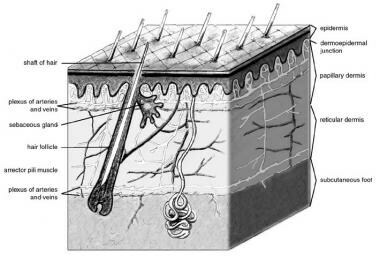 The loose papillary layer is located beneath the epidermal stratum basale and contains the capillary network that supplies the skin and the nerve endings responsible for touch sensation. The thicker reticular layer is composed of densely packed collagen that is responsible for the skin’s tensile strength. This layer also serves as the foundation for hair follicles, sweat glands, and sebaceous glands, and it contains the dermal plexus. Collagen is the main structural component of the dermis. Type I collagen constitutes 80% of dermal collagen and imparts tensile strength. Type III collagen comprises 15% of dermal collagen. It is found throughout the dermis and primarily serves to anchor the epidermis to the dermis. Elastic fibers comprise about 3% of the dermis and provide elasticity and resilience. Ground substance is an amorphous gel-like material that surrounds cells and imparts turgidity and resilience. The dermis is bound tightly to the epidermis by the dermoepidermal junction, which is the interface between the epidermis and the papillary dermis. The basal layer keratinocytes and dermal fibroblasts produce the components that characterize the dermoepidermal junction, such as anchoring fibrils that bridge the basal epidermal layer and papillary dermis. Beneath the dermis lies the subcutaneous fat, which derives its blood supply from arteries and veins located in the fibrous septa. Skin quality and appearance are affected by a variety of external and internal factors, which subsequently lead to skin conditions such as aging, photoaging, enlarged pores, and scarring. A distinction can be made between the changes in the skin that occur as a result of chronological aging and photoaging. Chronological aging, or intrinsic aging, is the irreversible and progressive loss of homeostatic capacity and is assumed to be a genetically programmed phenomenon. Photoaging results in changes in gene expression and results from exposure to ultraviolet radiation. Ultraviolet (UV) radiation consists of UVA, UVB, and UVC light. Short-wavelength UVC light is the most damaging type of radiation; however, it is filtered by the atmosphere and does not reach the earth’s surface. Thus, UVB light and UVA light are mostly responsible for tanning and aging. Upon contact with the skin, some light is scattered and reflected by the stratum corneum, while other light is absorbed into the epidermis. UVA light has a longer wavelength (400-320 nm) and is more able to penetrate the skin. UVA radiation accounts for about 95% of the UV radiation that reaches the earth’s surface. About 50% of UVA light penetrates the epidermis and reaches the papillary dermis. It is responsible for the immediate tanning effect, and it also contributes to skin aging. Most of the immediate and long-term effects of photodamage occur in the epidermis and dermis. The process of skin aging can be divided into intrinsic aging and photoaging. Chronologic aging is skin damage resulting from the passage of time, whereas photoaging is damage resulting from exposure to UV radiation. These are two distinct processes. Clinically, naturally aged skin appears smooth, pale, and finely wrinkled. On the other hand, photoaged skin is coarsely wrinkled and associated with dyspigmentation and telangiectasias. The most apparent differences between these two processes are evident in the dermis. Chronological aging affects all the layers of the face including the bone, ligaments, fat, and skin in the upper middle and lower portions on the face. Clinically, this results in bony resorption and reduction of facial skeletal support, atrophy of subcutaneous fat and volume loss, attenuation of the musculofibrous system, and gravity-induced soft-tissue redistribution. Alterations of the skin surface include thinning of the epidermis and dermis and loss of elasticity. Photoaging from chronic UV radiation exposure causes degenerative changes in the skin that are superimposed onto the normal chronological aging process. The aging process continues in a cycle of sustained collagen loss. Over time, this clinically results in thinning of the epidermis, wrinkling, loss of elasticity, dyschromia, and dermal atrophy. Histologically, the aging process first begins with hyperplastic response and increase in melanin production as it reacts to environmental insults. The process then shifts to skin atrophy and melanocyte dysfunction in the later stages of aging. Histologic changes in an aging dermis include solar elastosis, degradation of elastin and collagen fibers, and increased ground substance. Furthermore, DNA damage from radiation increases the risk of squamous and basal cell carcinoma. Microdermabrasion is most effective for superficial skin conditions, as it targets mainly the superficial skin layers of the skin. Superficial skin conditions include early photoaging, fine lines, superficial scarring, and reduction of pore size. Deep scars, acne scars, and rhytides require a greater depth of skin injury for effective treatment. Skin types I-III generally tolerate resurfacing procedures with minimal risk of pigmentary complications. Skin types IV-VI have a higher risk of pigmentary changes with deeper wounding, such as dyschromia, postinflammatory hyperpigmentation, and permanent hypopigmentation. Superficial wounding extends to the stratum granulosum or papillary dermis. Medium-depth wounding extends into the upper reticular dermis. Deep wounding extends to the midreticular dermis. Wounds that extend beyond this level can cause scarring, regardless of the skin type. Because microdermabrasion causes only superficial wounding, it does not carry the risks of pigmentary changes or scarring seen in other techniques, such as dermabrasion, chemical peels, or laser resurfacing. Even patients with Fitzpatrick types IV-VI who may be more at risk of pigmentary changes with other resurfacing techniques can undergo conservative microdermabrasion with relative safety, when performed by an experienced provider. Contraindications include current or recent use of isotretinoin (within 6 months of treatment) owing to the potential for hypertrophic scarring. [13, 14] Facial surgery within the past 2 months, radiation therapy to the head, or a history of hypertrophic scarring anywhere on the body are also contraindications. Shpall R, Beddingfield FC, Watson D, Lask GP. Microdermabrasion: a review. Facial Plast Surg. 2004. 20(1):47-50. [Medline]. Thami GP, Bhalla M. Microdermabrasion: Principles and Utility. Sehgal VN, ed. Dermatologic Surgery Made Easy. 2nd ed. New Dehli, India: Jaypee Brothers Pvt Ltd; 2012. Chapter 20. Mattioli Engineering. A new science in skin care. Available at http://www.mattioliengineering.com/version_usa/about.html. Accessed: March 2, 2018. Kim EK, Hovsepian RV, Mathew P, Paul MD. Dermabrasion. Clin Plast Surg. 2011 Jul. 38 (3):391-5, v-vi. [Medline]. World Health Organization. UV Radiation. Available at http://www.who.int/uv/faq/whatisuv/en/index2.html. Accessed: March 2, 2018. Chung JH, Seo JY, Choi HR, Lee MK, Youn CS, Rhie G, et al. Modulation of skin collagen metabolism in aged and photoaged human skin in vivo. J Invest Dermatol. 2001 Nov. 117 (5):1218-24. [Medline]. Sadick NS, Manhas-Bhutani S, Krueger N. A novel approach to structural facial volume replacement. Aesthetic Plast Surg. 2013 Apr. 37 (2):266-76. [Medline]. Lodish H BA, Zipursky SL. Collagen: The Fibrous Proteins of the Matrix. Molecular Cell Biology. 4e. WH Freeman; 2000. Longo C, Casari A, De Pace B, Simonazzi S, Mazzaglia G, Pellacani G. Proposal for an in vivo histopathologic scoring system for skin aging by means of confocal microscopy. Skin Res Technol. 2013 Feb. 19 (1):e167-73. [Medline]. Glogau RG. Aesthetic and anatomic analysis of the aging skin. Semin Cutan Med Surg. 1996 Sep. 15 (3):134-8. [Medline]. Durai PC, Thappa DM, Kumari R, Malathi M. Aging in elderly: chronological versus photoaging. Indian J Dermatol. 2012 Sep. 57 (5):343-52. [Medline]. Fitzpatrick TB. Ultraviolet-induced pigmentary changes: benefits and hazards. Curr Probl Dermatol. 1986. 15:25-38. [Medline]. American Academy of Dermatology. Microdermabrasion. Available at https://www.aad.org/public/diseases/cosmetic-treatments/microdermabrasion. Accessed: March 2, 2018. Bagatin E, dos Santos Guadanhim LR, Yarak S, Kamamoto CS, de Almeida FA. Dermabrasion for acne scars during treatment with oral isotretinoin. Dermatol Surg. Apr 2010. 36:483-9. [Medline]. Alkhawam L, Alam M. Dermabrasion and microdermabrasion. Facial Plast Surg. 2009 Dec. 25(5):301-10. [Medline]. Shelton RM. Prevention of cross-contamination when using microdermabrasion equipment. Cutis. Oct 2003. 72:266-8. [Medline]. Karimipour DJ, Karimipour G, Orringer JS. Microdermabrasion: an evidence-based review. Plast Reconstr Surg. 2010 Jan. 125(1):372-7. [Medline]. Jean Bolognia; Joseph L Jorizzo; Julie V Schaffer. Dermatology. 3. Philadelphia: Elsevier Saunders; 2012. Bourelly P, Lotskias-Baggili A. Chemoexfoliation and Superficial Skin Resurfacing. Burgess C, ed. Cosmetic Dermatology. Berlin, Germany: Springer; 2005. 76-80. Shim EK, Barnette D, Hughes K, Greenway HT. Microdermabrasion: a clinical and histopathologic study. Dermatol Surg. Jun 2001. 27:524-30. [Medline]. Karimipour DJ, Rittié L, Hammerberg C, Min VK, Voorhees JJ, Orringer JS. Molecular analysis of aggressive microdermabrasion in photoaged skin. Arch Dermatol. 2009 Oct. 145(10):1114-22. [Medline]. Tan MH, Spencer JM, Pires LM, Ajmeri J, Skover G. The evaluation of aluminum oxide crystal microdermabrasion for photodamage. Dermatol Surg. Nov 2001. 27:943-9. [Medline]. Lloyd J. The use of microdermabrasion for acne: a pilot study. Dermatol Surg. Apr 2001. 27:329-31. [Medline]. Goldberg DJ, Russell BA. Combination blue (415 nm) and red (633 nm) LED phototherapy in the treatment of mild to severe acne vulgaris. J Cosmet Laser Ther. Jun 2006. 8:71-5. [Medline]. Coimbra M, Rohrich RJ, Chao J, Brown SA. A prospective controlled assessment of microdermabrasion for damaged skin and fine rhytides. Plast Reconstr Surg. 2004. 113(5):1438-43. [Medline]. Andrews S, Lee JW, Prausnitz M. Recovery of skin barrier after stratum corneum removal by microdermabrasion. AAPS PharmSciTech. 2011 Dec. 12 (4):1393-400. [Medline].